Poolscapes, by their very nature, are designed to complement the breathtaking beauty of the landscapes they take up residence in. Whether viewed by day or night, they can be daring and dramatic. An award-winning design in Arizona’s Paradise Valley, for instance, brings a bit of magic to the majestic mountains that surround it. The project was designed by Arizona-based Presidential Pools, Spas & Patio, which has built more than 30,000 residential pools. Presidential Pools, which is independently ranked the No. 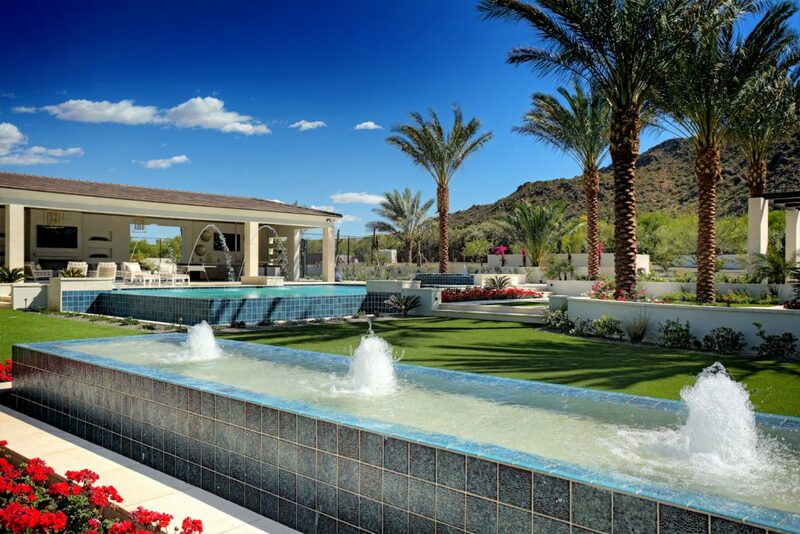 1 pool builder in Arizona by Pool & Spa News, and is the second largest in the country, uses Pentair products in all its projects. A trio of bubblers directly in back of the main house sets the tone for the project, which includes a pool with jets and a spa that transforms into a fountain. Murphy credits Pentair’s innovative products with helping to put its projects on the cutting edge. The backyard of the nearly two-acre property with views of the Camelback and Mummy Mountains features tennis and basketball courts, a substantial putting green, a cabana equipped with a pool table and a flat-screen TV, and a pergola with a latticed roof. The poolscape builds upon the landscape, which includes a pergola and palm trees. The house is built on a hillside, and Marc Scott, luxury pool designer at Presidential Pools, was able to play with the elevations to get everything to connect visually. “The pool, for instance, is elevated and follows the natural slope of the property,” he noted. All the elements are connected via limestone walkways and decking that complement the home’s exterior color and finish. Patches of artificial turf reference the fronds of the tall palms. When night falls, the poolscape puts on a dazzling light show that plays out against the backdrop of the mountains. The Pentair IntelliBrite 5G color-changing LED lights in the pool and the spa are reinforced by the three laminar deck jets that, too, alter their hues on cue. The pool, which features a trio of water jets, is sited off the cabana. Because the property was so large, Scott envisioned it as a series of intimate social-gathering spaces, where people can congregate and chat, whether they are floating on an inflatable tube in the water or standing poolside sipping a cocktail. The vanishing-edge pool sets the stage for the rest of the poolscape. The main component of his design is a dynamic blue-tiled vanishing-edge pool sited right outside the cabana; its water falls into a basin below that features four bubblers. The pool has three sheer descents topped off by long, rectangular fire channels. A trio of jets arc gracefully over the water for aesthetic reasons; they also are a source of sound. The pool connects to the oversized vanishing-edge spa, which when not in use transforms into a vibrant decorative feature via a telescopic fountain. The vanishing-edge pool, which has three fire features and sheer descents, and the vanishing-edge spa, which becomes a fountain when not in use, take their visual cues from each other. Another trio of bubblers, positioned directly in front of the back porch of the house, invites people to explore the palm-tree-studded property. The poolscape’s beauty belies the complex technology behind it, which was achieved with Pentair lighting, water features, fire features and sanitizer, circulation, and automation systems. Scott says that the goal of the project was to make a visual impact. The design was a success resulting in a 2018 Association of Pool & Spa Professionals Gold Award in the “Concrete, Vanishing Edge (601 square feet or more)” category.